EarthTeam interns at American H.S. have been hard at work to address the #1 category of trash at their school: materials associated with disposable water bottles. Check out their journey to reduce #bottletrash on their campus. Interns at Oakland High School have completed a series of litter blitzes at Lake Merritt for a cumulative effect. They began with a litter survey identifying cigarette butts as a major source of litter and areas of, concentration, and then worked with city officials to install ashtrays at strategic locations. 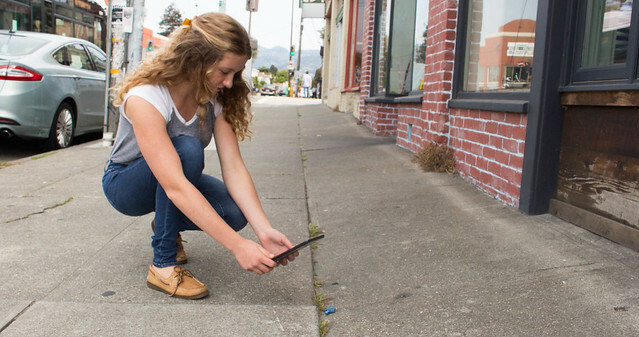 See how their #litterblitz helps keep Lake Merritt clean. Like most places, San Lorenzo High has a litter problem. When interns realized a major source of litter was coming from their lunch room, they decided to do something about it. They launched a Change.org campaign to petition Apple & Eve to rethink their juice box packaging. They have 7,000 signature and counting. Learn about their journey - the results might surprise you. Richmond interns completed their first waste audit, sorting through over 23 pounds of classroom trash to find out what ends up in their waste stream. They were shocked to learn that over 50% of their classroom trash was comprised of recyclable materials. Find out how they're working to lower that percentage. After completing a waste audit of their classroom trash, interns lead the way to decrease the amount of recyclable materials placed in trash bins. Now they're taking it a step further, transforming litter into art to raise awareness in their school. Sneak a peek at the work of art. Want to do more today? Get the Zero Litter Project curriculum, now available free of charge for anyone to launch a Zero Litter Project campaign to empower youth and improve watershed health in their community.